Hot Springs Baseball Grounds was a baseball park in Hot Springs, AR and was the home field of the Hot Springs Base Ball Association and the Hot Springs Blues. In addition, it was used as a major league spring training site from 1886-1893. "Hot Springs Baseball Grounds" is the title given to the location that hosted baseball games in Hot Springs prior to the erection of Whittington Park in 1894. The title was given by modern historians and was not original to the grounds, which had no known specific designation. 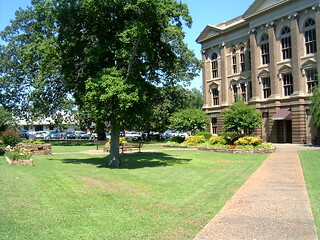 Present-day grounds of the Garland County Courthouse. It's not clear when the Hot Springs Baseball Grounds were built. 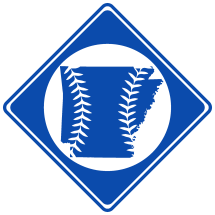 Hot Springs was first used as a spring training camp by the Chicago White Stockings in the spring of 1886, and though the location of the team's original training grounds is not entirely certain, it is assumed that they used the Hot Springs Baseball Grounds. In June of that same year, the Hot Springs Base Ball Association erected an enclosed baseball park, complete with a grandstand and dressing room, on the site of the Hot Springs Baseball Grounds.45 The following spring, Chicago utilized the baseball association's new ballpark when the team returned to prepare for the 1887 season.6 With no known mention of a new baseball park built in Hot Springs until Whittington Park in 1894, it is assumed that the grounds of the baseball association were the primary grounds used for spring training during the next several years. The following is a list of spring training camps believed to be held at the Hot Springs Baseball Grounds.